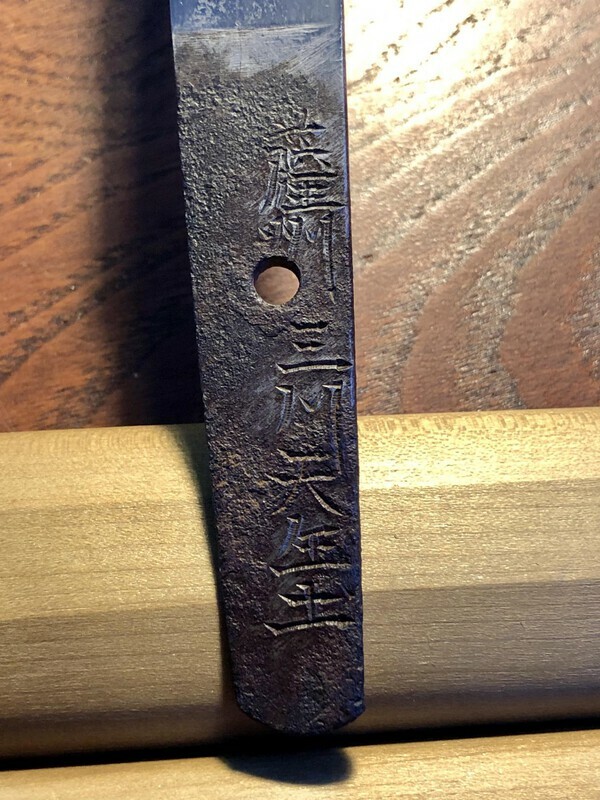 Here is a new gendaitō tantō I picked up at the Tampa Japanese sword show earlier this month. It is small likely made as a lady’s dagger. It is my first signed and dated sword. It is signed ‘Sashū Mikawa Tensaido’. Here are quick photos with my iPhone better photos will come later. The ji-hada is a fine ko-itame. 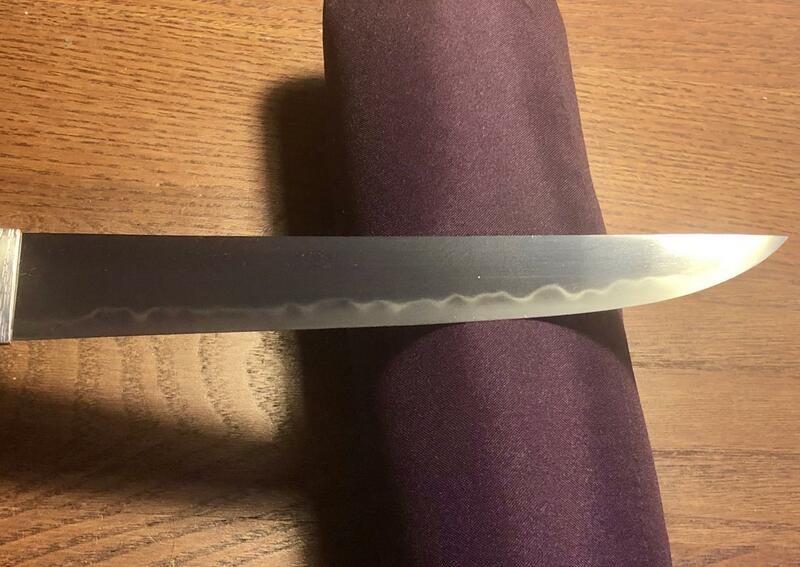 The hamon has a gunome-midare shape. Feel free to politely discuss. 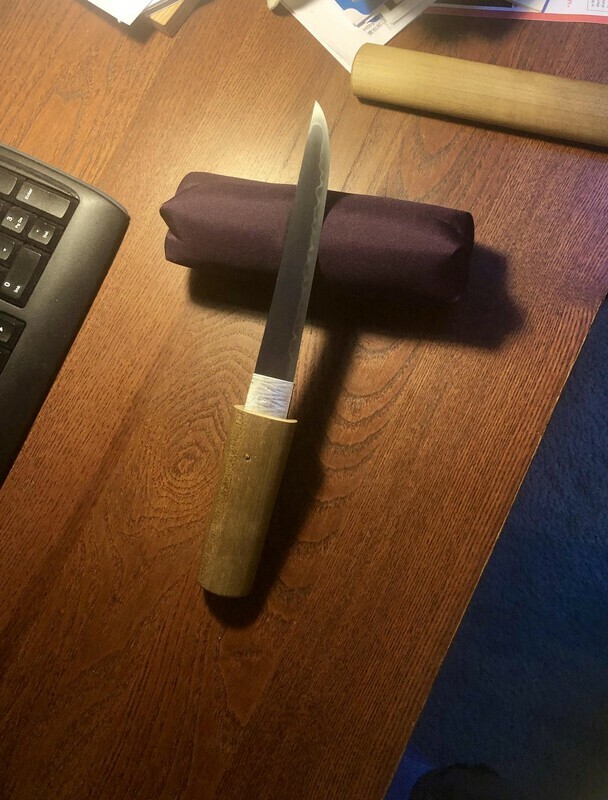 my polite comment is that it looks like a nice little TANTO, but it is not a dagger. These have two cutting edges. 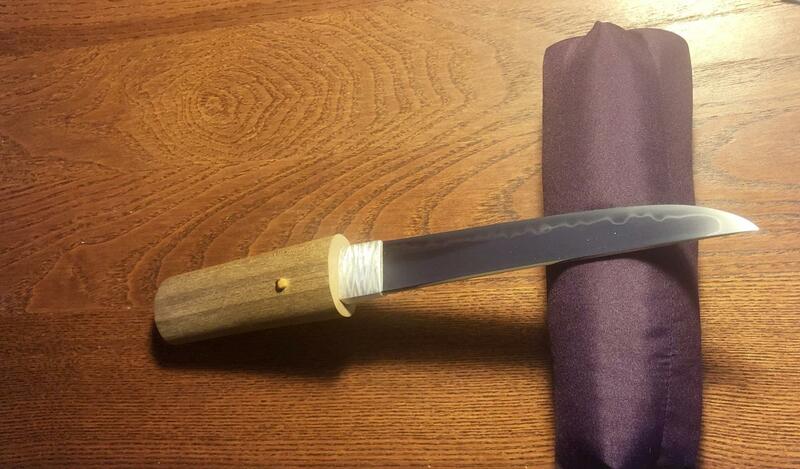 I like it...interested in Gendaito tanto. I need help with date...nakago looks older? Yes, you are correct it is a knife. The date on one side of the nakago is second year of the Meiji Period (1869 CE), first day of the second month. Historically, "dagger" has been used for both double- and single-edged knives used as weapons. Modern usage tends towards defining a dagger as being symmetric and double-edged, but this is neither universal practice nor a law. Etymologically, the origin of the word is unclear, but most signs point to the core meaning being "knife", "point", and "stab" – nothing specifically double-edged. In terms of connotation, the most important characteristic of a dagger appears to be that it is a short stabbing weapon. Ultimately it depends whom you are speaking to, but I personally wouldn't blink at someone calling a tantō a dagger, and in fact I think I have explained tantō as being "Japanese daggers" to non-enthusiasts before. "Knife" doesn't capture the weapon-based intent nor substantial size of tantō when conveying the concept to neophytes, in my humble opinion. Tantō were not used as tools, as knives would be. This sort of linguistic ambiguity is of course completely avoided by just sticking to using "tantō" of course. Going off on yet another tangent: since this tantō was made before 1876 – the ban on swords – I consider it shinshintō, not gendaitō. Let's not debate semantics again. Tanto works. David, I think this is a lovely piece, and ticks all the boxes. Signed, dated, good condition and lovely to look at. Well done, it's a great pickup. I would love to hear a confirmation of the mei, as Tensaido sounds a bit odd? In the passed on my website and other mediums I have used the term ‘dagger’ to describe tantō. I will continue doing so. Changing now would be a waste of time. Brian, I can’t confirm the reading of the mei. While it can be read like this it might not be correct. The reading was what the previous owner was thinking from his notes. 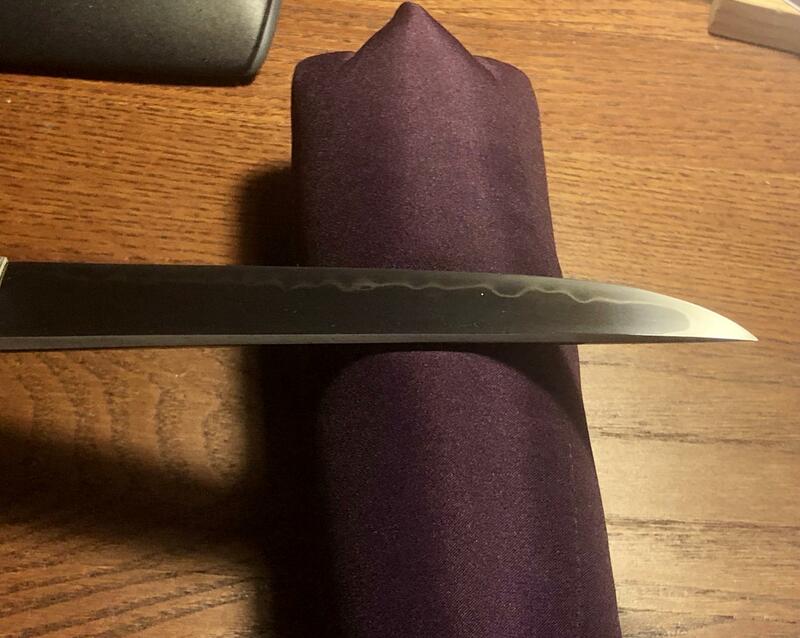 First, nice tanto! Sorry for off topic but Funny I was reading a similar argument in regards to an antique print I was interested in. The seller labeled it a "Lithograph" but technically (and lawfully) lithos must have been made from the original painting and by the artists hand. Otherwise it's just a reproduction, which isn't bad per say. Consulting some offline nihontō references you are correct my little old tanto is technically shinshintō not gendaitō because it was made pre haitōrei of 1876. David, would you post a pic in the translation section, would like to get alternate readings of the mei so we can pin your guy down. Unusual way to write the year, using a mixture of year number and zodiac cycle. The smith (if 天生士 indeed is a name) seems to be meikan-more, and I’m not sure how to read/pronunce those kanji. Guido, I also noticed it to about the year. I am going to post it in the translation section as per Brian suggestion.